Also, start this process THE DAY BEFORE you plan to serve the wings. This is very important. 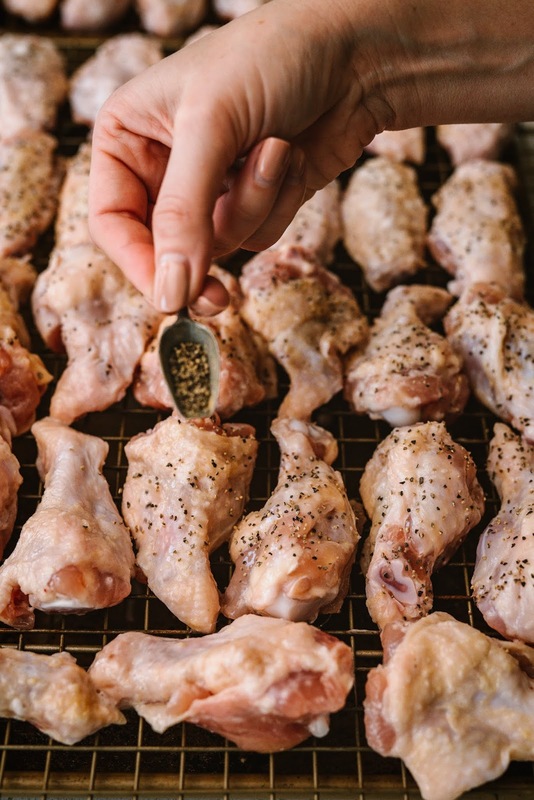 One of my secrets to achieving crispy wings in the oven is to incorporate a little baking powder in my salt mixture (not to be confused with baking soda.) 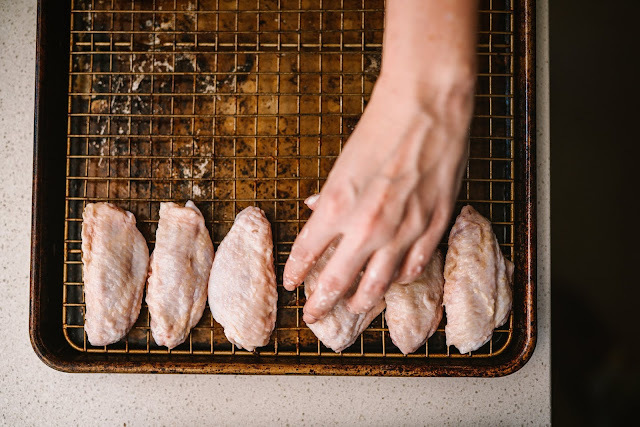 You get a little dry brine action from the salt, and the baking powder does some crazy science stuff where it changes the pH of the chicken skin and promotes quicker browning. It also helps draw the moisture out of the skin, which can help make it crispier as well. This is especially important when trying to achieve crispy skin in the oven versus frying in oil. 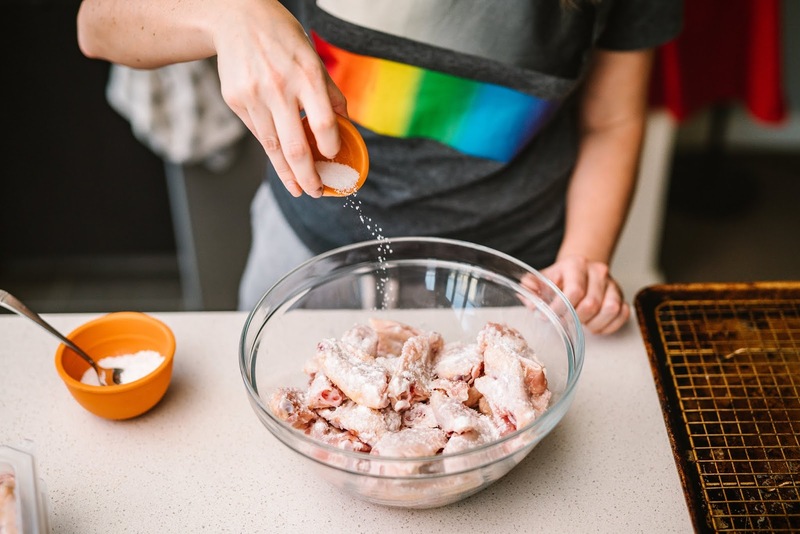 Use 1 teaspoon baking powder per every pound of wings and use 2 teaspoons of salt per 3 pounds of chicken. Basically... I had 3 pounds of wings, so I used 3 teaspoons (or 1 tablespoon) of baking powder, with 2 teaspoons of Kosher salt. Mix them together thoroughly, and distribute evenly over the chicken. Don't be afraid to get your hands dirty to get it all mixed up. Set a cooling rack inside a large baking sheet (or in my case two), and spray it with nonstick cooking spray (you can also line the baking sheet with aluminum foil for easier cleanup.) 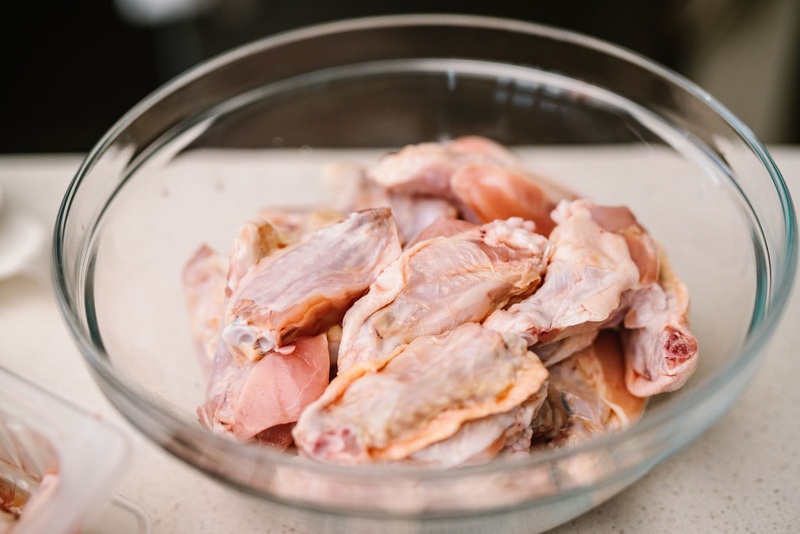 Place the chicken wings on the rack skin side up and, place in the fridge, uncovered, ideally overnight to dry out the skin. (Yes, it takes a little planning, but it's very much worth it.) At the very least, give it a few hours. Place in a 250 degree oven to continue drying out the skin even more. 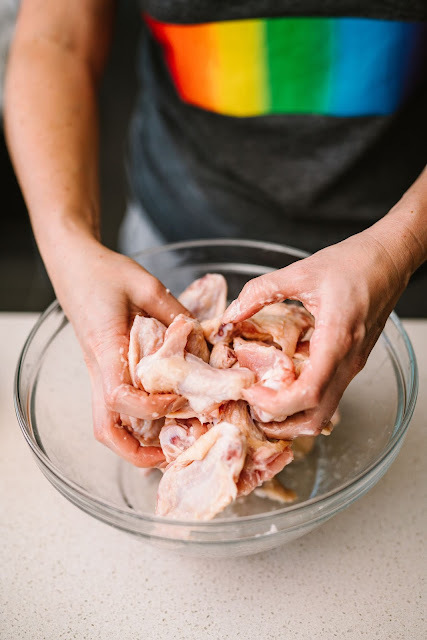 (If you were able to leave the wings overnight in the fridge, you only need to do this part for about 10 minutes. If you weren't able to do the fridge step, then I would increase this to 25 minutes.) The wings will not look very appetizing at this point... the most important thing is the skin looks good and dry. Then, increase oven temperature to 450 degrees and cook for another 25-30 minutes, or until skin is bubbling and golden brown. I didn't find it necessary to flip the wings, but if you feel better about it... then by all means, go for it. You can also run them under the broiler for a couple minutes at the end if the chicken is cooked but the skin isn't as brown as you'd like. 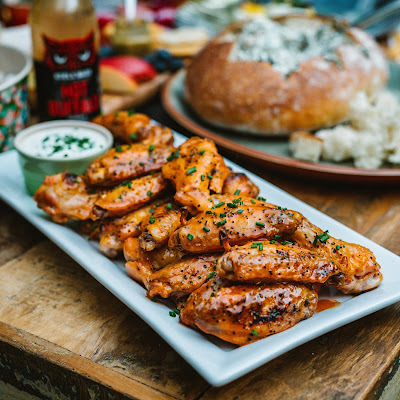 While wings are cooking, you can prep the Buffalo sauce and the blue cheese dressing, if using. If you follow me on Instagram, then you know I'm obsessed with all of the New Primal Buffalo sauces. I think they are absolutely fabulous as-is (and much healthier to boot), but if you want to get a little fancy, you can add in a little honey (or Mike's Hot Honey if you have it), and a 1-2 tablespoons of butter. Pour over the hot chicken wings and give it a good toss with some tongs. For the blue cheese sauce, all you need is crumbled blue cheese, sour cream, mayo, lemon, Worcestershire sauce, white wine vinegar, granulated garlic, s&p, and freshly snipped chives. 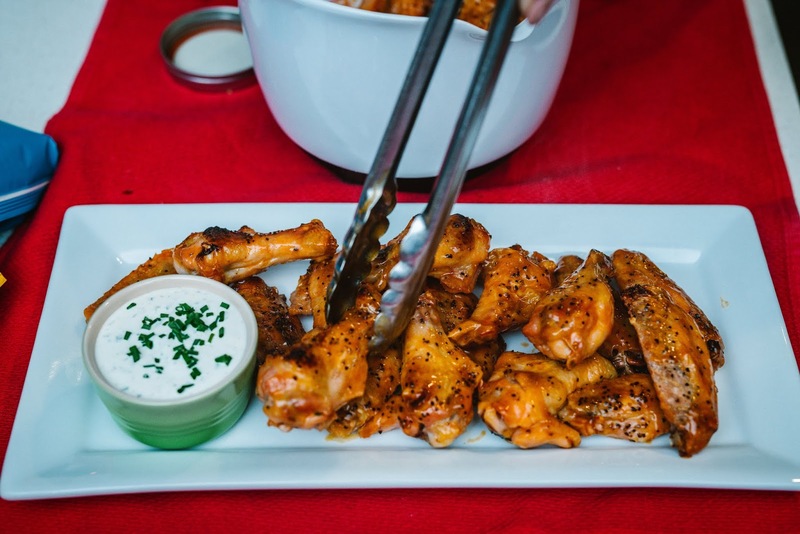 Plate the wings next to a little ramekin of the blue cheese dressing. 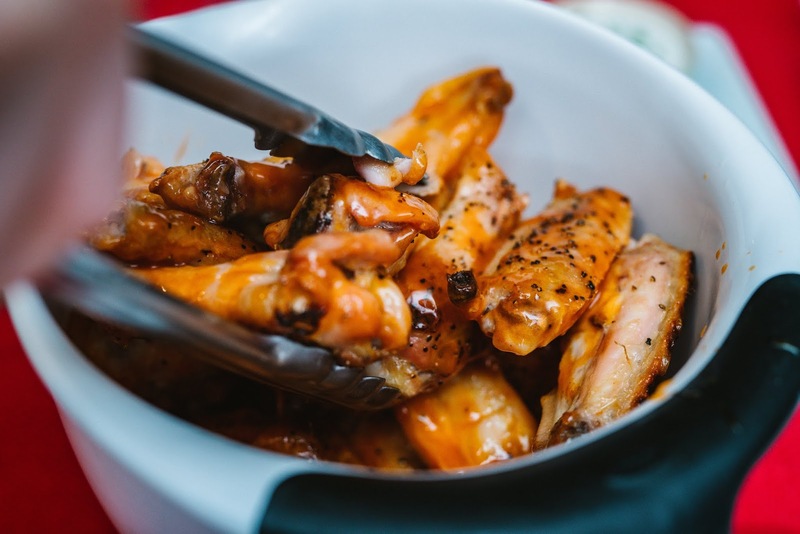 Place wings in a large bowl. Mix together baking powder and Kosher salt. Evenly distribute the salt mixture over the wings. Mix with hands or tongs. Line a large, rimmed baking sheet (or sheets) with aluminum foil and place a cooling rack inside. Spray rack with nonstick cooking spray. 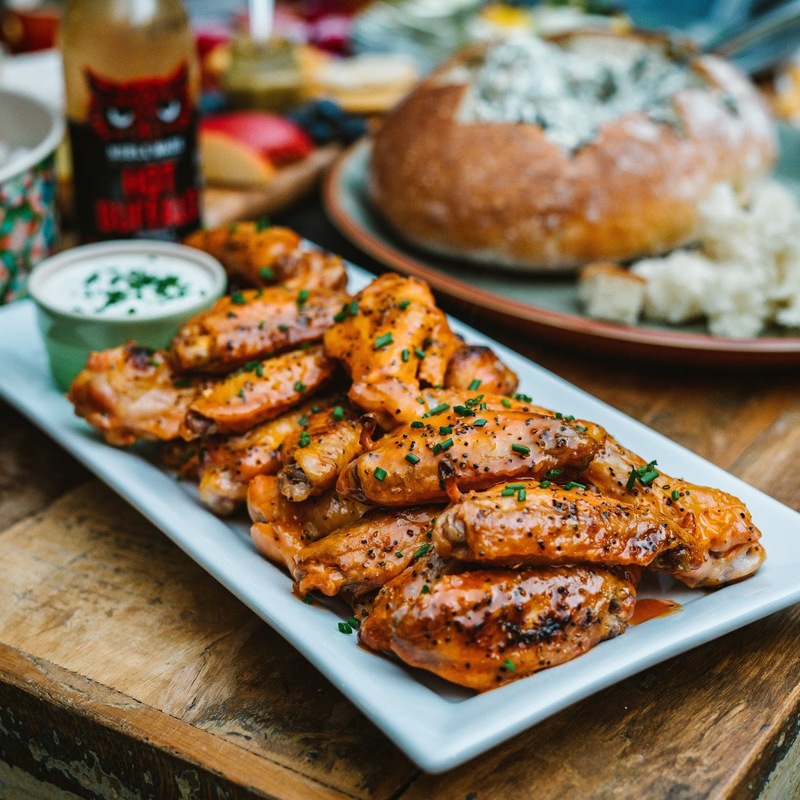 Place wings on rack, with a slight space in between each one. Place uncovered in the fridge overnight. 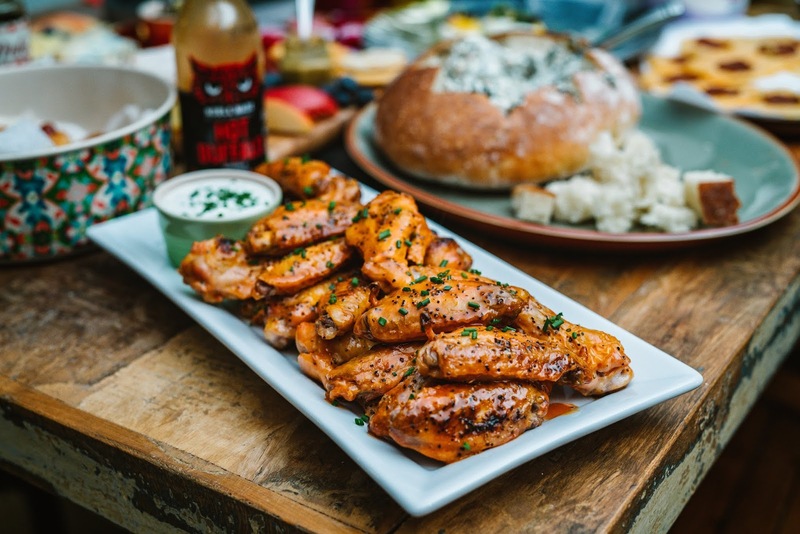 While wings are cooking, prep the Buffalo sauce and the blue cheese dressing. 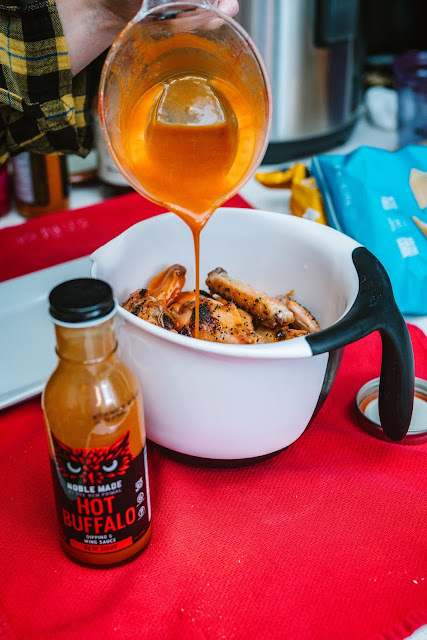 Mix together Buffalo sauce, honey & butter and heat over low heat on the stove OR microwave for 30-60 seconds in a microwave-safe bowl. Mix together all ingredients and refrigerate at least 30 minutes or until ready to serve. Top with additional chives, if desired. As someone from Buffalo these look great going to have to try them. And big props for using Bkue Cheese. Let me know if you end up trying them! I love blue cheese! These look delicious. I like finding ways to get crispiness without frying. Going to try it. Thanks.